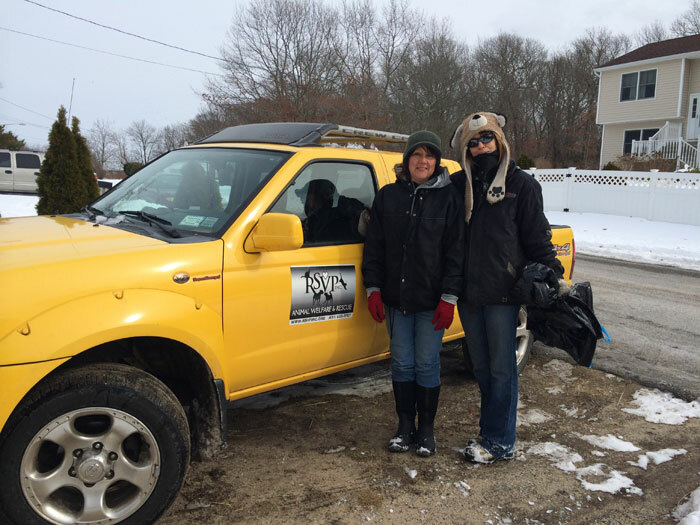 Volunteers from the Riverhead Shelter Volunteer Program’s outreach group Liz, left, and Kelly during a weekly run. 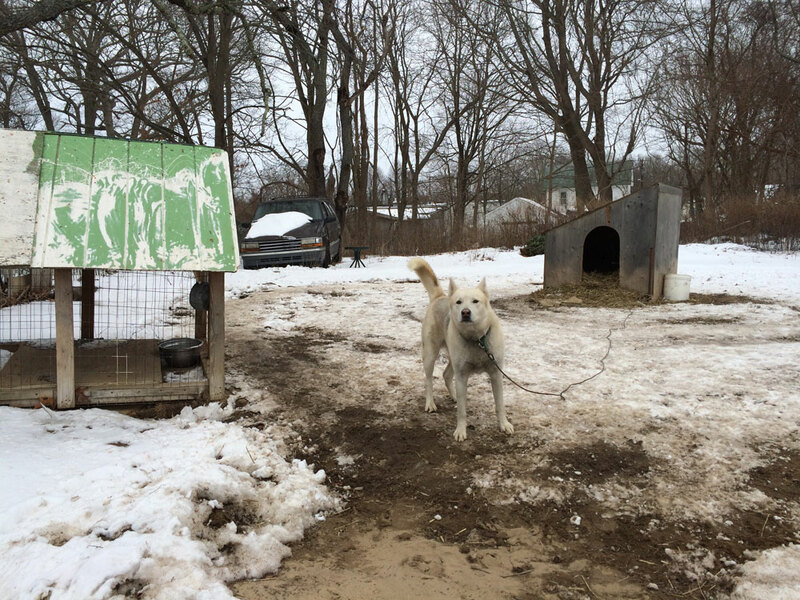 Three times a week they deliver food, water, hay and medical supplies to more than 50 chained and neglected dogs throughout eastern Long Island. The volunteers of the Riverhead Shelter Volunteer Program work in impoverished neighborhoods beset by drug dealers, prostitutes and gangs. Rain or shine, they traverse rundown properties; yards strewn with litter or barren save for neglected dogs perpetually chained outdoors. They interact with some of the most dangerous people living in some of the most insulated communities on Long Island. They do it because they ache for their cause. The nonprofit dog-rescue group known as RSVP is unlike any other operating on Long Island. The community outreach arm is comprised of 10 members who thrice weekly deliver supplies — food, water, medicine, bales of hay — to more than 50 dogs who live their lives at the end of a length of chain. Anywhere from four to eight hours at a time, they work with delinquents, convicts and backyard breeders whose trust they’ve earned by investing time, being persistent and operating without judgment. They educate them on pet care and often successfully convince them to spay and neuter their dogs. In the last decade, RSVP has extricated about 375 dogs from abusive homes and found them sanctuary. And she won’t turn her back. The 55-year-old mother of three was back in her small yellow pick-up truck —“RSVP Dog Rescue” stickers on its doors, brimming with supplies — making deliveries barely a month after suffering a major injury. At one of the regular houses on her run, a pit bull lunged at and bit her chin, causing lacerations that required 80 stitches and multiple plastic surgeries. But volunteering with RSVP has become a way of life for Kelly and other members of the group. They bargain, barter and beg pet owners to accept their help; spend personal money on supplies, and give of their own time to prepare meat donations to supplement dry dog food. Many of them, Kelly included, foster dogs relinquished to RSVP. Kelly and others have made it their mission to spread awareness about the issue. “People need to realize that this still happens in this day and age, right here on Long Island,” said Liz, a community outreach volunteer who’s been with RSVP for two years. The work Kelly, Liz and their fellow RSVP outreach members do is controversial. Despite infiltrating communities that are difficult to access, the volunteers have been accused of enabling pet abusers by giving them supplies and providing medical care for their dogs. But they believe the work they do is an absolute necessity. “We try to brighten the lives of animals out there,” Liz said. The volunteers said they’re about taking matters into their own hands. “We’re like the little group that could,” Kelly said. In addition to heir work with chained canines, RSVP works with cats, rabbits and other small creatures. What the group needs now is support: financial donations, food, medicine, veterinary care, foster homes, permanent adoption homes, a storage facility and a bigger truck. They also encourage people to become educated about the issue and to lobby for better laws and better law enforcement. Visit rsvpinc.org for more information. Volunteer Kelly in a donated storage shed where the group keeps donated food. 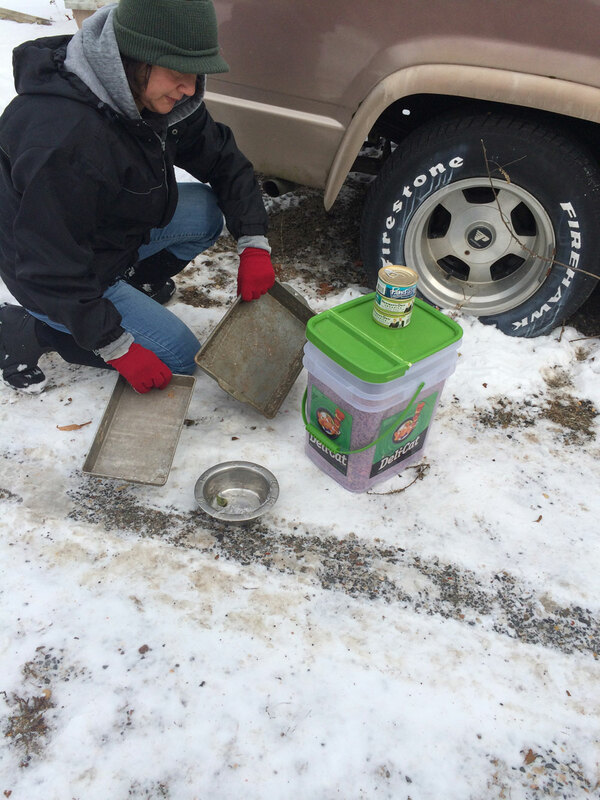 Because the shed is outdoors, wet canned food often freezes in the winter, making it difficult to distribute. 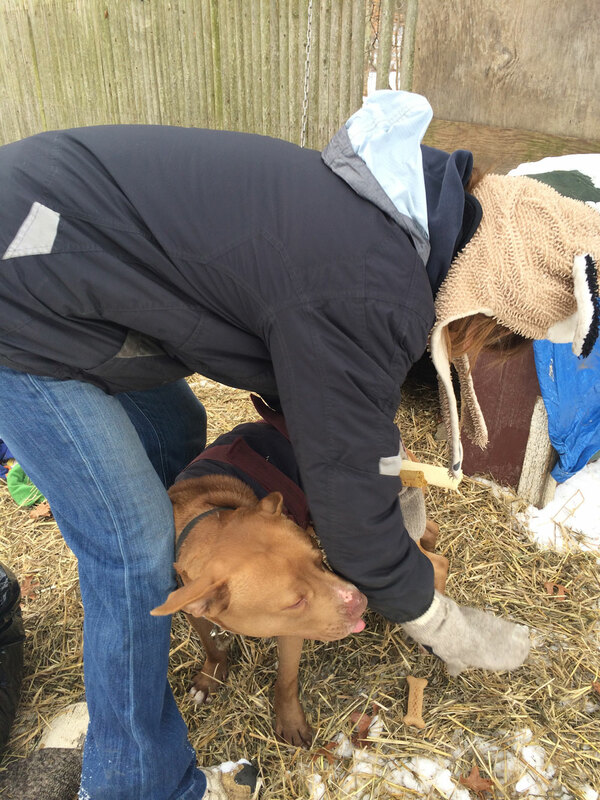 Kelly adjusts a donated coat on a dog who's been living chained outdoors for several years. 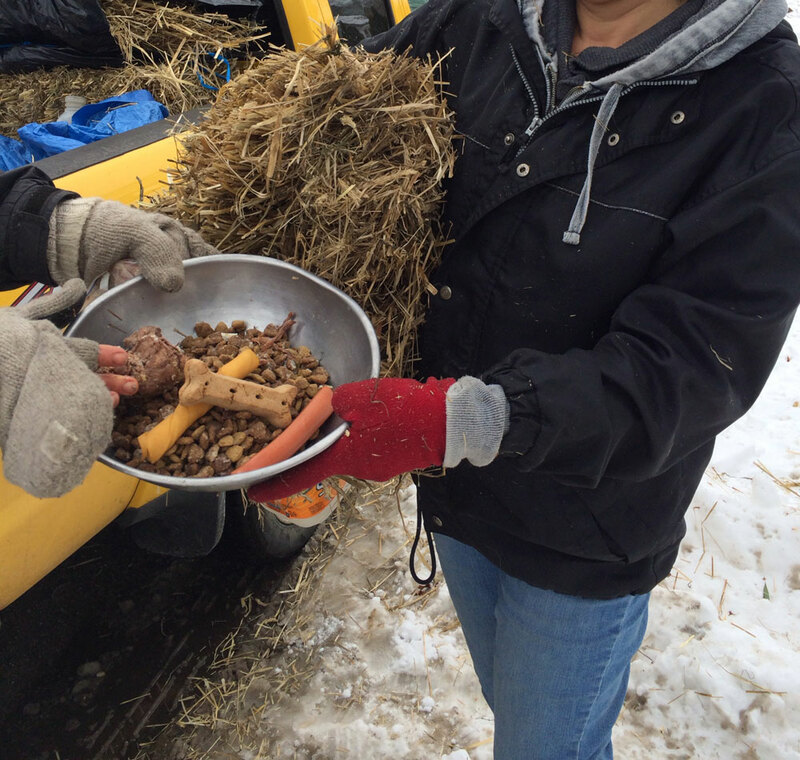 RSVP installed a cable so that that dog could run in the yard, and bring him food, water and hay weekly. When possible, volunteers also spend time visiting with the dogs, who are often times starved for attention. This fenced-in dog is just one on a property that contains six, including the dog that bit Kelly, leaving her with severe injuries. 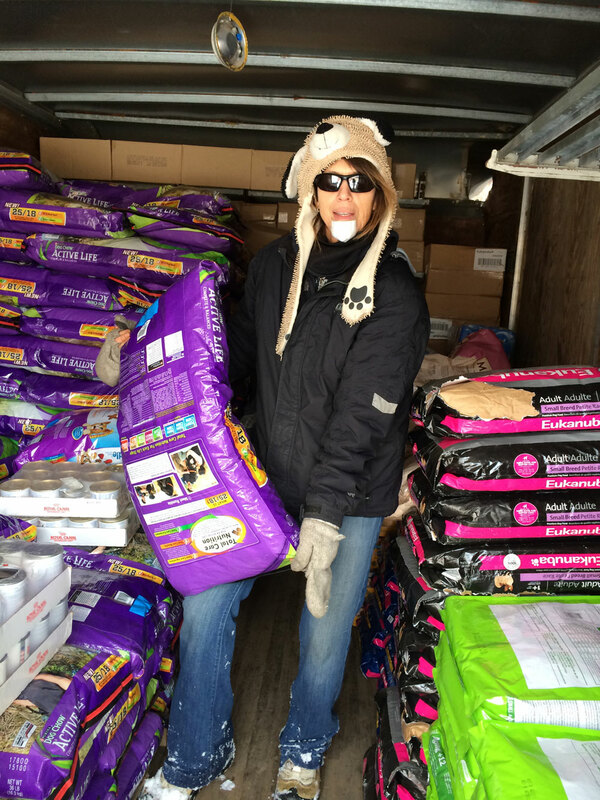 RSVP continues to bring donated supplies to the dogs. 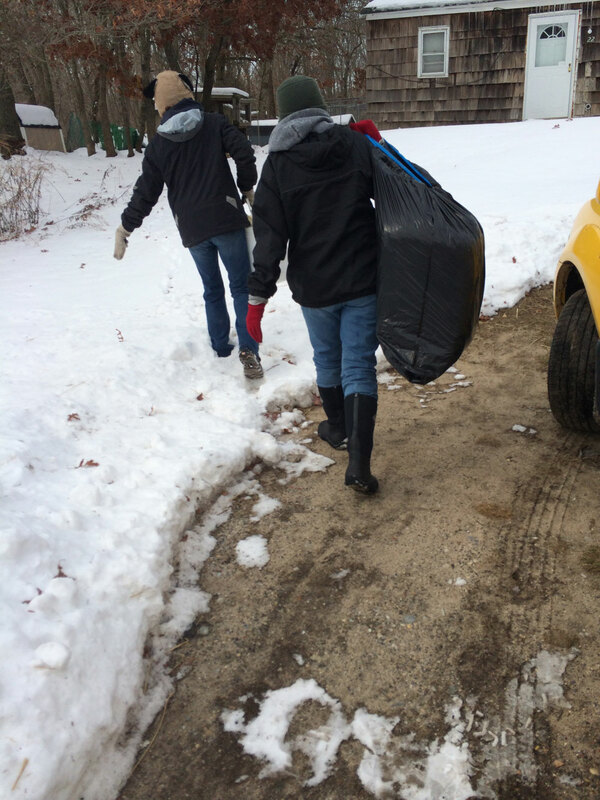 Kelly and Liz carrying bales of hay and other supplies to a home that keeps six large dogs chained or fenced-in outdoors year-round. Liz preparing trays of food for cats. Although RSVP's outreach group focuses primarily on dogs, it offers aid for other animals as well, including cats and rabbits. The volunteers heap dog food high. In addition to kibble, they prepare donated meat, such as venison, for the dogs, who need as many calories as they can get. They also provide raw-hide and milk bones as treats. 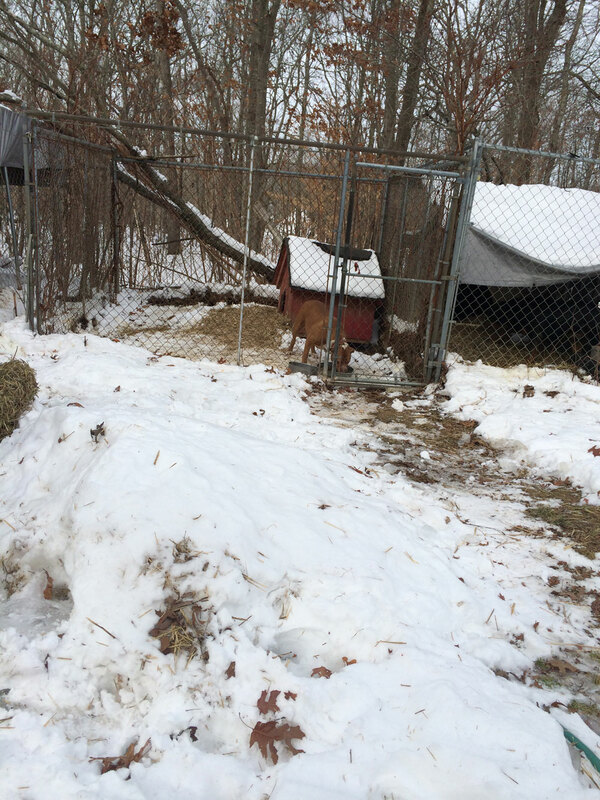 This husky was living in an opened, uninsulated area, as seen on the left, before RSVP brought him a sheltered dog house and filled it with hay to keep him warm and safe from the elements.